RECRUITS WORK IN THE VINEYARDS, BLEND THEIR OWN WINE AND MORE! Wine Boot Camp®, the extreme insider experience for adventurous Wine Lovers, challenges recruits to dive into wine by rolling up their sleeves and plunging into winegrowing and winemaking during a one-day reconnaissance mission. Wine Boot Camp® is the ultimate fantasy experience. An intensive, highly enjoyable one-day training program, hands on the vineyard, hands on the cellar. 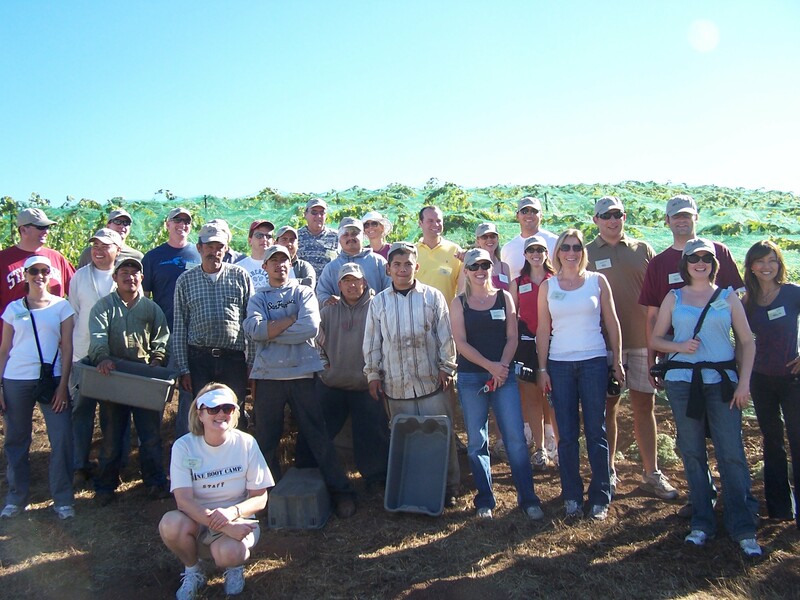 Wine Country is the training site for Wine Boot Camp®. Troops will gather as we challenge their senses, awareness and understanding of fine wines. Wine novices and experts alike will find our program as challenging as it is entertaining. We guarantee that upon completion of our basic training, your team’s marksmanship in the field of fine wines will be right on target. This intensive yet highly enjoyable training program will provide you and your team with the experience and knowledge needed to become totally confident in the understanding and appreciation of fine wine. Business colleagues and friends will marvel at the leadership of your team as they storm the wine lists of America and the world. •	An Aromatic Team Building Competition conducted by officers of Affairs of the Vine. Participants will be advanced into the ranks of winemaker, learning the basics at the heart of winemaking. Utilizing selected varietals, each participant will create a wine blend that they feel is the best. Each guest will take home a bottle of the wine blend they selected with a customized label to commemorate the experience. 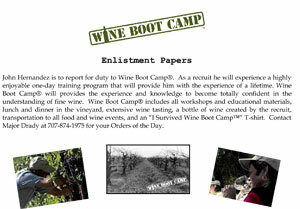 Wine Boot Camp®, an interactive experience can be attended by raw recruits and wine generals alike. This exclusive Affairs of the Vine program will be customized for you. Wine Boot Camp® will enable your group to become totally confident and competent in their understanding of fine wine. Affairs of the Vine can provide a Wine Boot Camp® experience for your team in Napa Valley, Santa Barbara, the Santa Cruz Mountains, Sonoma County, Temecula Valley, Willamette Valley or Wine Country anywhere in the world. Wine Boot Camp® provides the experience and knowledge needed to become totally confident in the understanding and appreciation of fine wine. People will marvel at the leadership of “Camp” graduates as they storm the wine lists of America and the world. Wine novices and experts experience firsthand the joys and frustrations of winemaking. Wine lovers work hands-on in the vineyard and the cellar under the tutelage of top winemakers and viticulturists. Wine workshops and tastings of outstanding wines are an integral part of the program. Conducted by AFFAIRS of the VINE, Wine Boot Camp® is a challenge to the senses, awareness, and understanding of fine wines. Upon completion of basic training, recruits’ marksmanship in the field of fine wines will be right on target. This exclusive Affairs of the Vine Program is offered as an open course or can be tailored as a special event or team building experience. The cost of WINE BOOT CAMP® includes all seminars and educational materials, working in the vineyard, lunch with wine in the vineyard, dinner paired with appropriate wines, extensive wine tasting, a bottle of wine created by the recruit, transportation to all food and wine events, and an I Survived Wine Boot Camp® T-shirt & cap. Order a Wine Boot Camp® Gift Certificate. If you’re purchasing a Gift Certificate, please type “Gift Certificate: name to be placed on gift certificate” in the Ordering Instructions box in the shopping cart. 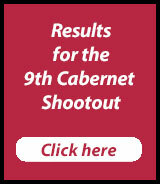 Innovator of Wine Boot Camp®, Affairs of the Vine is the top wine education company in the industry. Experienced educators enthusiastically share their knowledge and love of wine through interactive workshops that are educational, fun, and entertaining. AOTV conducts extensive wine industry training, corporate wine events, and team-building workshops. In 2014, AOTV passionately poured wine for and wine knowledge with over 200,000 people. 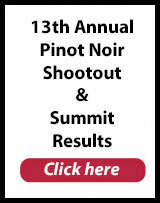 Our website and social media outreach interacts with over 1,500,000 wine lovers per year. Would like to register for bootcamp for two people. You can reach me at 707-874-1975 or I will be happy to call you.